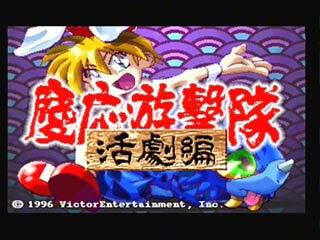 Keiou Yuugekitai ~Katsugeki-hen~ (慶応遊撃隊　活劇編) is an Action - Platform game, published by VICTOR ENTERTAINMENT, which was released in Japan in 1996 for the Sega Saturn. First off, who came up with the idea to combine a platformer and a shmup? Had to be the Japanese. Anyway, it works for the most part. Our sequel to the Sega CD gem Keio Flying Squadron, which ranks up there as one of the harder shmups, finds its way to the Sega Saturn thank you amen. This game is your typical Japanese eye-candy festival with loads of colors, thankfully not pastels, and plenty of gaming to be had. Graphically the game is quite impressive with the Saturn s-video cable clearing up most of the pixilated stuff leaving you with a crisp yet smooth image throughout. The levels are all well designed, and the music is another typical Japanese affair, but the game isn't without some flaws. The control throughout the platforming levels seems to lag just a fraction of a second making you second guess your timing a lot. Whatever you do, don't change directions in mid-air unless you are prepared for some serious screen-scrolling back and forth. It takes a few minutes to get used to this, but once you do there doesn't seem to be any problem as long as you are prepared. The more you play, the less you'll notice it. The shmup levels are what you'd expect from a Keio title and harken back to the Sega CD, but with less difficulty, which is fine since Keio Flying Squadron suffered from overkill in this department. The easiest way to ruin a game is to make it so difficult you can't get anywhere without cheating. On the other hand, making a game so easy a 5 year old can beat it in one sitting doesn't help either. 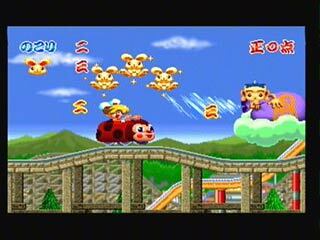 The first few levels of Keio suffer from this, but the game gets progressively more difficult. Overall Keiou Yuugekitai is a solid title covering both the platforming genre, and the shmup genre, which will surely satisfy fans of both. 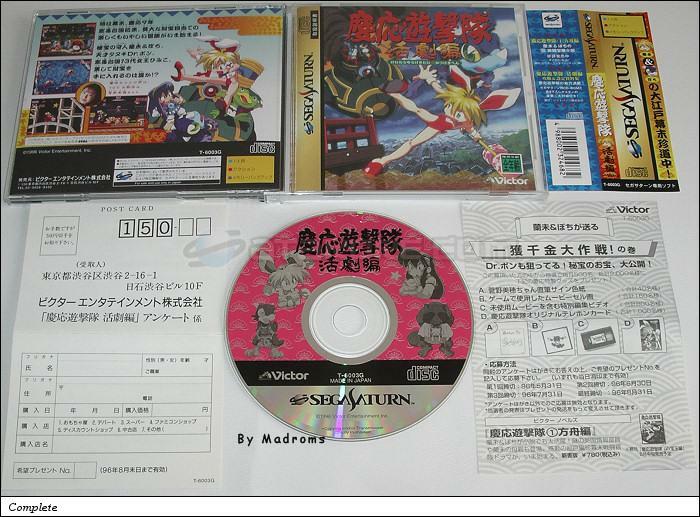 There was also a bonus (Omake) disc of this released in a Japanese magazine which is quite rare.